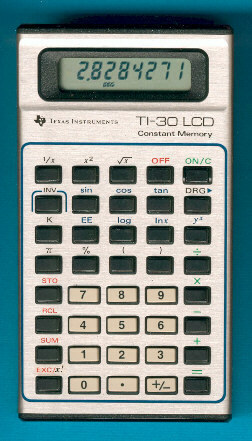 The first version of the TI-30 LCD could be recognized with the x!-key instead the later n!-key. View the later version here. The TI-30 LCD is actually only one half of a slimline calculator. The flat bottom of the case shell was removed and a stepped one accomodates 2 huge AA-cells. This modification was done for the European market, you'll locate the same bottom shell on the TI-2001 GTI or the TI-1032. The electronics of this calculator is identical to the TI-30-II sold as a real slimline calculator elsewhere. In Brazil a similiar calculator was manufactured under license of Texas Instruments, don't miss the SR-40 LCD.